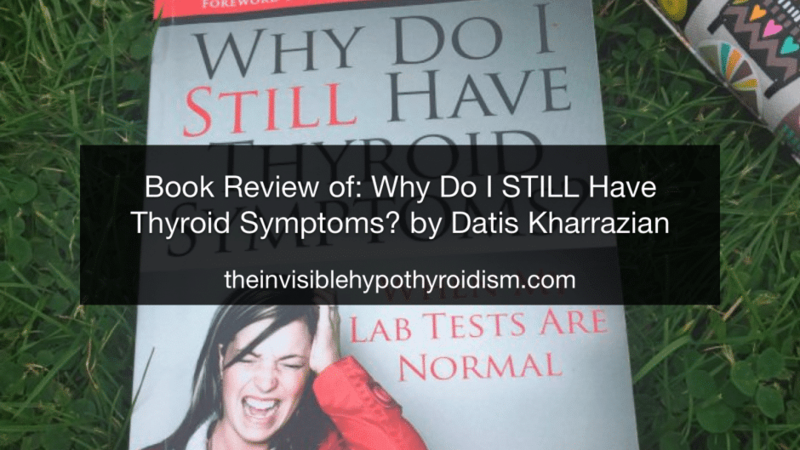 Book Review of: Why Do I STILL Have Thyroid Symptoms? This book explores more in-depth, what could be causing your underactive thyroid, namely Hashimoto’s Thyroiditis, and what has led to it. Dr Kharrazian particularly focuses on how diet and lifestyle changes could potentially reverse your condition so you no longer need thyroid medication. This is a popular thyroid book. I bought this book last winter and have only just gotten round to finishing it. I’d started a few books and this one was put on the back burner whilst I finished those. Although very scientific at times, this book is eye-opening and explores what could have started or contributed to your hypothyroidism and/or autoimmune disease Hashimoto’s, and what you could do to reverse this, so that you no longer need thyroid medication. Dr Kharazzian, DHSc, DC, MS, explores why your thyroid tests may be coming back ‘normal’, yet you still have symptoms and struggle daily. His main suggestion is Hashimoto’s and antibodies. He believes in a holistic approach, i.e. looking at the whole body and not just the thyroid. Most conventional doctors and medical professionals only consider thyroid medication for treating hypothyroidism, and whilst this medication is necessary for some patients to feel well, Dr Kharazzian explains that he believes there are six patterns of thyroid dysfunction, and out of those six, only one warrants thyroid medication. These patterns are included in the book so you can see where you fall. He is 100% all for going gluten-free and he suggests all Hashimoto’s patients at the very least go gluten-free. I like his analogies of the thyroid, for example imagining that the thyroid is a car with issues, and these issues must be addressed instead of ignored. The book firstly introduces you to the thyroid, how it works, what it is etc. which then follows on to his outlines of the mechanisms behind Hashimoto’s. These are very interesting chapters. He encourages you to address what the faltering thyroid says about the body and fix this. When doctors just prescribe thyroid medication, it ignores the underlying problem; what has caused Hashimoto’s to occur and destroy the thyroid gland in the first place. This can lead on to more gradual destruction of the gland. I like the case studies he uses and the references from other medical professionals throughout the book. The way in which they are presented in boxes and ‘bubbles’ makes it easier to read and digest, which is particularly great for those of us with thyroid brain fog. These extra titbits back up what he is saying and give another view from other medical professionals and/or colleagues of his. He covers the swinging of TSH levels and Hashimoto’s which is so very important to be aware of, as well as Iodine, a controversial topic which he explains supplementing it is like throwing gas on a fire. – definitely worth a read. He covers the tests you need doing to check for Hashimoto’s and also insulin resistance and PCOS which I haven’t come across before in another thyroid book yet. I particularly found his explanation of how ranges are worked out for lab tests, interesting and eye-opening. Basically, lab ranges are determined by the average of the patients who had blood tests undertaken by that lab in that past year. Therefore these are often skewed as we can assume that the people having blood tests are in some degree of poor health, with some already taking thyroid medication, or have an undiagnosed thyroid condition. Functional ranges for tests are much more narrowed which allow for prevention before a condition or disease becomes ‘too bad’. The chapter which was the most helpful to me was on blood sugar imbalances. The symptoms sounded so much like me that I bought a home testing kit to check my blood sugar, and I’m finding it does drop a little low sometimes, so I’m learning how to manage my diet a bit better to keep this balance. He covers hypoglycemia and insulin resistance symptoms.- Both things fairly common with hypothyroid patients. So worth checking out. He covers adrenal health and leaky gut also, which is really interesting. Learning about both of these areas is crucial for thyroid patients and their doctors. Oestrogen dominance is explained quite a bit and how those contraceptive pills, hormone creams and potions could be leading/have lead to your thyroid symptoms. There’s no doubt that Dr Kharazzian is a very knowledgeable man. I’d recommend this book, although probably not as one of your first thyroid books as it can be quite heavy.